I used to buy overcoats too small. Because I didn’t wear a jacket all the time, I picked the size that fitted over a sweater, which was too small with a jacket. Now if anything I buy overcoats too big: to make sure they fit over anything, including double-breasted, highly structured flannel suits. I need an overcoat that can do both. So, together with the good men at Graham Browne (who made my rather excellent bespoke suit recently) I am designing one that will have a full pleat all the way down its back, beginning just below the neck. That pleat will be covered with a half-belt (just covering the back) which can be tightened to three settings – T-shirt, bulky sweater and suit jacket. At its largest setting, the pleat will be fully open and able to accommodate a heavy suit underneath. At its smallest setting, it will be fitted at the waist even if I’m wearing nothing. Now of course the biggest effect will be at the waist – it will not help adjust the width of the shoulders (to cope with a suit’s shoulder pads) and the cinching will decrease the further up the drape you go. But the overcoat’s waist is really the biggest problem with fit as it has less structure than the shoulders. Military capes used to have a similar pleat to this. And the effect can still be seen on some coats today that have a small pleat above the waist (an ‘action back’) and a pleat or vent below. But I haven’t seen one yet that has a pleat all the way down, together with a half belt. Having the coat made bespoke will also help, as it can be constructed to fit very snugly over my biggest jacket, allowing just enough room at the shoulder and armhole. Off the peg it is often hard to get this and the waist right in any particular size. To match some of the structure and complication of the back, I also plan to have turn-back cuffs and a split seam down the arm (that is an extension of the shoulder seam, rather than running down the back of the arm). 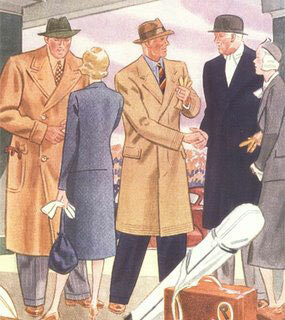 Both can be seen in the picture above of the gentleman wearing a polo coat in cream. I think they are nice and slightly old-fashioned details. However, one thing I am unsure of is whether to also include the other details of the traditional polo – raised seam, patch pockets, double breast. 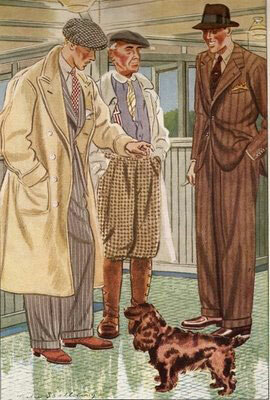 Should I keep it simple and single-breasted, as on the man in the centre-right below (though without the covert coat seams, obviously)? One factor is that both my other coats are double-breasted; the other is that I am afraid a full polo coat with the pleat in the back will be too cluttered. You can follow the discussion on The coat project by entering your email address in the box below. You will then receive an email every time a new comment is added. These will also contain a link to a page where you can stop the alerts, and remove all of your related data from the site. Why don’t you just get it double breasted again? the fact that you have 3 merely means you like double-breasted overcoats, and after all, a bespoke item should be something that you like, rather just added variety. Is there even a reason for which single-breasted is required anyway? Thanks for your thoughts. My only fears were the piece being too cluttered, but I agree it should be double-breasted if that is what feels right. I think a polo coat should have all the traditional details – you’ll only see the patch pockets from the front and the pleat and belt from the rear so it shouldn’t look too cluttered. If it’s to be single breasted I think it needs to be plain and understated – a simple three button, notch lapel coat with a normal vent at the back. Sputnik, I believe an overcoat should be worn below the knee, say an inch or two – my tailor says the standard used to be 11 inches off the ground. A topcoat, on the other hand, which far lighter in weight, should finish above the knee. I’d go with the double-breasted as well: you’ll appreciate the extra warmth when it’s cold and blustery. Besides, it’s a good look, and more in keeping with the classic by which you are inspired. It seems to me that the other way you can make the shoulders fit, regardless of what you are wearing underneath, is to get raglan sleeves. Raglan sleeves are not my favorite look, but Will’s latest topcoat has them–and I would love to have one just like his (in my size, of course). I hope to see follow-up posts about this topic. I’m currently considering having a custom topcoat made and I’d love to see what you decide upon and how it turns out (pictures please!). I recently discovered your blog and enjoy looking for new posts each day. Keep it up! Are the bespoke coats you’ve had made ( and displayed ) canvased or fused ? Would it be unusual to stitch rather than fuse a canvas chest-piece in an overcoat or topcoat ( as distinct from a suit ) ? Hey Henry – all canvassed. All bespoke overcoats will be and most high-end RTW ones should be too.